SUMMARY: #3 of several posts related to this weekend. I lose my head about training opportunities when I have a chance to win. Jackpot (Gamblers), Full House, and Snooker. Rereading some of my old posts, I sound quite braggy. The thing is, especially after my first two dogs, it still astounds and delights me when we can outperform most of the other dogs. I'm not used to it! I don't take it for granted. And it thrills me to do it. I love running with my dogs. Tika and Boost are bost so fast, it's quite a rush emotionally being out on a course with them. Like driving a race car might thrill one. But I do have several competitive bones in my body and I like excelling, too. CPE really gives me a chance to do it; I've commented on that before. Fortunately, there are enough talented dogs and people in CPE to keep my head from becoming too inflated. 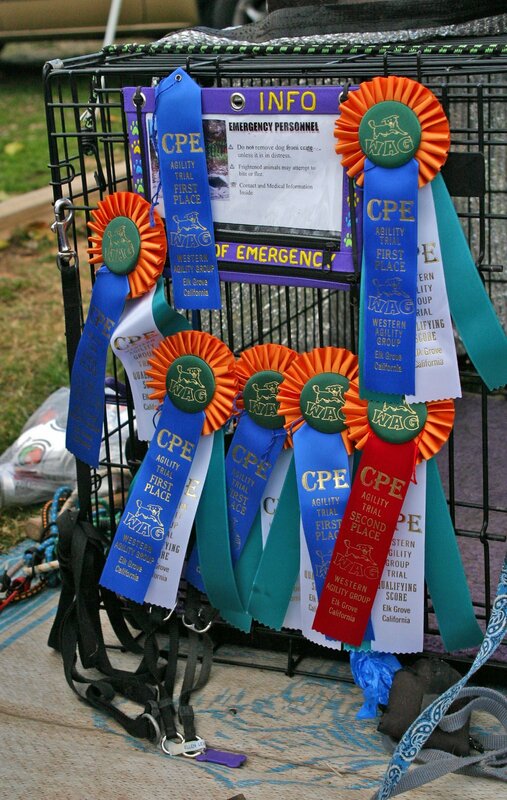 Although not many dogs compete at 24" in CPE (where I run Tika because she's 26" in USDAA), several of the dogs who run 20" in CPE do compete directly against us at 26" when they do USDAA, and often whup our butts. It's just nice that, in CPE, it's not EVERYONE who regularly whups our butts. In particular, I enjoy the strategy games (in USDAA and CPE) because I think I'm fairly good at figuring out good courses. My execution may leave something to be desired, and if something goes awry, I'm bad at thinking on my feet. But it's nice to have classes that rely on strategic thinking as much as speed. Friday at the end of the day, Tika had earned Qs and 1sts in 5 out of her 5 classes. An auspicious start. Boost was only 4 for 5, but still good for a babydog. Saturday, 4p.m. Tika is now 9 for 9, and they're all really nice runs. I'm pretty happy. I'd have waited for class #10, but it was starting to get dark. Turns out she didn't Q in that one, anyway. Oh, well. Boost, Saturday 4 p.m. Q rate is dropping; only 2 for 5 today. Now, that doesn't mean that I don't want competition. I often tell the people who are likely to beat me (at CPE) what my courses are, if I think I have an especially good, high-point course. This isn't entirely altruistic, mind you--if we all run the same course and I still beat them, it gives my ego a boost. And if I don't beat them but they use my course instead of what they came up with, it gives my ego a boost for my ability to plan courses. 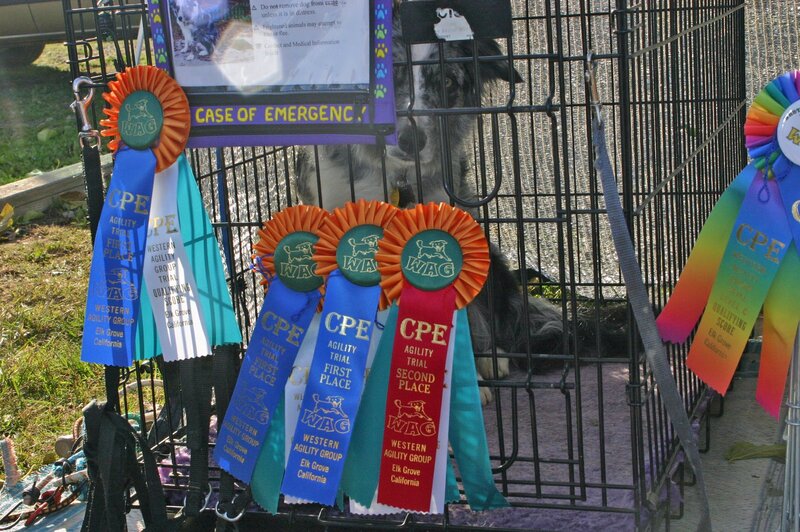 And, in CPE, I enjoy getting the first places--and they're well-earned, usually, even if Tika is competing directly against only a couple of other dogs, because she often has scores that are at the top of all dogs, all heights, all levels at the trials. Maybe I just have a sagging ego that needs a lot of propping up, dunno. We had five point-accruing classes this weekend: Two Full House, a Snooker, and two Jackpot. Full House rules: You must get at least three one-point obstacles, two 3-pointers, and one 5-pointer, plus additional obstacles of your choice to make at least a minimum number of points within 30 seconds (35 for small dogs). If you take too long to get to the finish after the whistle blows, you start losing points. There are always three 5-point obstacles on the course, and they can be anything the judge chooses. If there are contacts on the course, they are 5-pointers, but the judge can designate others (weaves, doubles, combinations, etc.). Otherwise, it's like a gamblers opening--take each obstacle up to twice for points, standard kinds of obstacle points. This had no contacts; 5-pointers were 6-pole weaves, a double, and a broad jump. It was pretty easy to come up with a variety of loops that incorporated all of those obstacles twice for fast dogs, plus plenty of 3-pointer obstacles to supplement those. Once again, Tika executed beautifully; one time I wanted to do a tight wrap but she swept very wide, so at the end she was halfway through a tunnel when the whistle blew, so she didn't get those 3 points. She had the 2nd-highest score of all 130-some-odd dogs; the 3-pointer would've put her at the top. Boost ran past a couple of jumps, ran OVER the broad jump, and knocked a bar, so she had fewer points than Tika, but still 8th highest of all dogs. In this game in CPE, the highest points that you can get are 51, but it often takes some tricky maneuvering (and speed) to do it. Plus, if you make a mistake, you are whistled off and your point-accumulation ends. On this course, Tika was one of 8 out of about 95 dogs who got 51 points, but she was the 2nd fastest to do so, so only one dog beat her. Boost sailed right into an offcourse at the beginning due to the handler misjudging the poor Border Collie's experience level. This was a traditional gamble (wait for the whistle then do a gamble at a distance) with a tunnel to a teeter. I have a problem with Boost blasting out of a tunnel towards me rather than looking for the next obstacle, so I knew I'd have trouble with her in the gamble. I had a nice opening-point course that I again really liked. Execution was the thing, though. Tika did not stick her Aframe, so I was behind her afterwards, and she turned back to me, getting in my way, to tell me that I was too slow, so I had to slow down and then get her turned back to where I had wanted her to go. As a result, she was just taking off for the piece-de-resistance final 3-point obstacle when the first whistle blew; therefore, we didn't get those points, and then we had some confusion before getting her into the gamble zone, but she did the gamble perfectly. Because of that "missing" 3-pointer, she was 8th highest overall of 105 dogs, 4th highest of big dogs (little dogs get 5 more seconds to accrue points); with those 3 points, she'd have tied for 2nd highest. Boost just doesn't keep going when I'm behind her; she turns to see what I'm doing, then starts jumping around in front of me, FACING me, which makes it hard to get her going again. We ran into that twice in the opening, wasting a ton of time, so didn't get as far as Tika, and, as expected, although our timing was perfect for entry to the gamble, I could not in any way, shape, or form, get her to even take half a step in the direction of the teeter in the gamble. So she had respectable opening points but no Q. This very nontraditional gamble had elements that made it very Snookerish, with mess-up opportunities for being whistled off the course. Once again, I came up with a course that I think had high-in-trial potential, but results weren't posted before I left, so I don't know--and I had forgotten about a 2-jump combo that was actually worth 5 points so didn't use it, which could have upped our score by at least 2 points without any effort, so maybe someone beat us. Tika did everything I asked of her, except that she didn't stick the A-frames (duh--wasn't this one of my goals for this weekend? ), resulting in long turns to where she needed to be, and as a result we ALMOST missed getting to the table in time--just half a second away from a non-Q. The Booster had bobbles in several places, although her contacts were lovely, her tunnels are always superfast, and her weave poles were fast and correct. However, on the tunnel-under-the-Aframe bit, she TWICE popped out of the tunnel from the A-frame right when the first whistle blew, and while I stood there stewing about whether it was training in the ring to MAKE her do the damned tunnel or whether I should skip it and go to the finish, or what exactly I should do anyway, our time expired, so I got NEITHER the gamble score NOR the training opportunity. Brain freeze. Three days just too much agility for me. Wow, congrats on all of that. Looks like it was well worth gutting it out in the cold. As far as "bragging" goes, I say brag away! Nothing wrong with a person being proud of their dogs and of the successes they have together and wanting to share it with their blog readers. :-) I for one enjoy reading about it all. It's inspiring to us newbies to the sport. You wondered about "sagging ego[s] that need a lot of propping up"... I've come to think an interesting (human) psychology article, or at the very least, a good-natured humour piece, could be written about agility, ribbons, titles, egos, and the demographic of handlers. Actually that's probably already been done; I'd sure love to read it if anyone can point me to one.